"All you have to cook is the pasta!" In large serving bowl, combine roasted red peppers, tuna, parsley, olive oil, capers, garlic, and salt and pepper. Drain pasta. Toss immediately with tuna mixture. Turn scallops and leftover potatoes into an easy, impressive meal. I was thrilled to have all of the ingredients on hand. I liked it far better than my husband. Sorry, I won't be making this again. Simple, easy and very good...!!!! This is a great quick meal, I like it with more peppersa nd capers. 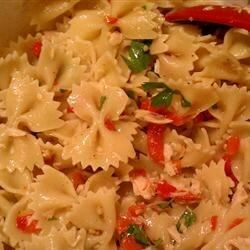 I usually adore roasted red bell peppers, but this recipe dulled them. Doubled tuna and added onion to make palatable; was better cold.